Ever since the dawn of computing, clunky interfaces have made the user experience a challenging prospect. While they had come a long way from the days when mainframe CPU’s filled entire rooms, desktop computers still required one to close themselves off in a specific place away from most people when being engaged by the user. Even today, most laptops are heavy, hot, and stand out obtrusively in social situations. However, with the creation of the iPad and subsequent emergence of Android-powered competitors, all this changed, as a tablet computer, which is approximately the size of a book (but much thinner and lighter in composition) had finally made personal computing not just a user-friendly experience, but also a physical experience that was much less awkward than its predecessors. Thanks to its portability and its versatile shape and interface, a wide variety of uses that has transcended casual web surfing and work productivity tasks has emerged in recent times. The following uses of the tablet computer are innovative, inspiring, and just plain wacky, but they go to show how pervasive and widespread it has infiltrated our daily lives in the past few years. For generations, fiddling with the audio, creature comforts, and other controls while attempting to pilot your vehicle has often been a struggle. Symbols don’t make sense, dials are placed in the strangest places, and let’s face it: most setups are hideous in their appearance. By taking out your default panel though and replacing it with a tablet computer, you can setup an entertainment center that is much more intuitive, user friendly, and one that looks absolutely stunning. Best of all, the best setups can be directed by voice commands, adding a badly needed element of safety to a part of the driving experience that many point to as a source of distraction. Artists have been drawing on pads of paper and painting on canvas for much of the history of civilization, but with the dawn of touch-sensitive computing, a new medium has been added to their arsenal: tablets. Special add-on products pair an app with a physical drawing stylus, allowing artists to create a picture with a full suite of digital tools at their disposal. It adds a degree of natural expression that had been missing with mouse cursor-driven design, and pioneering creatives have begun to take notice of this new avenue for artistic expression. 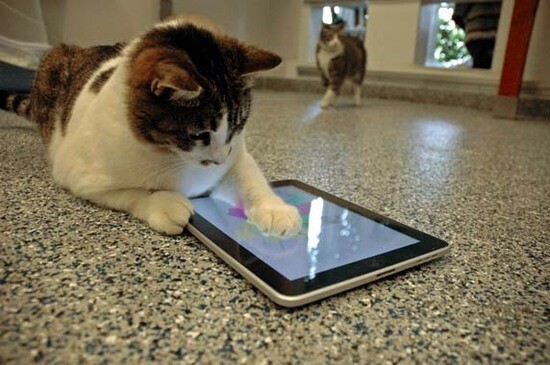 As the tablet revolution marches forth, even our furry friends are joining in. Apps like Paint for Cats uses an on-screen mouse to lure kitties into swiping at the screen, creating artful masterpieces that the two of you can appreciate together. In case you’re worried about scratching your screen, iPads are resistant against this risk, and with the next-generation screens rumored to be practically indestructible, there’s little to worry about in this department. Do you have any other creative uses for tablets?